The forth beta version of iOS 8.4 Firmware has been seeded by Apple i.e. iOS 8.4 Beta 4 (Build: 12H4125a) and Xcode 6.4 Beta 4 (Build: 6E31c). The latest iOS 8.4 Beta 4 Firmware Update includes Apple Music streaming service that will debut on 30th June 2015 this month. Apple iOS developers and non-developers can upgrade and install the newest released beta version instantly. The Direct Download Links of iOS 8.4 Beta 4 IPSW Firmware Files for iPhone, iPad, iPod Touch and Apple TV devices are available below. What's New in iOS 8.4 Beta 4 Features? The iOS 8.4 Beta 4 (12H4125a) Update changelog holds new features and functionalities addition with bugs fixes, improvements and enhancements for stability, security and performance etc. 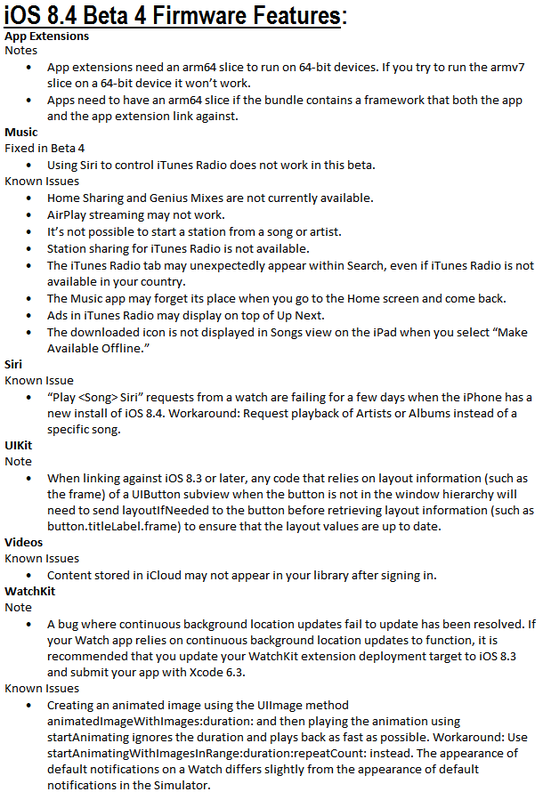 You can read full iOS 8.4 Beta 4 changes in below image! What's New in 6.4 Beta 4 Features? The Xcode 6.4 Beta 4 (6E31c) Update release note includes; iOS 8.4 Beta 4 SDK support, OS X Yosemite 10.10 SDK support and Apple Watch SDK support. How to Manually Install iOS 8.4 Beta 4? 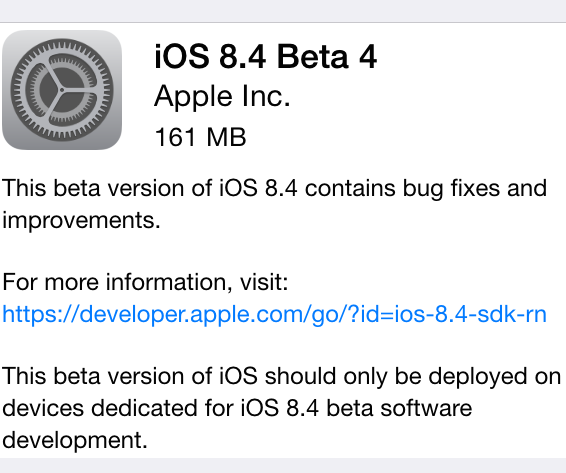 To instantly get iOS 8.4 Beta 4 OTA Update (Over-the-Air), just navigate to Settings > General > Software Update option. Apple iOS developers can get full iOS 8.4 Beta 4 Downloads officialy through iOS Dev Center website. Non-developers (general public users) can install and activate iOS 8.4 Beta 4 via iTunes without UDID developer account for Free. Download iOS 8.4 Beta 4 IPSW Firmware for iPhone 6 Plus, iPhone 6, iPhone 5S, iPhone 5C, iPhone 5, iPhone 4S, iPod Touch 5G, iPad Air 2 6G, iPad Air 5G, iPad 4G, iPad 3G, iPad 2G, iPad Mini 3, iPad Mini 2, iPad Mini and Apple TV 3G via Direct Links. How to Jailbreak iOS 8.4 Beta 4? Untethered iOS 8.4 Beta 4 Jailbreak is not possible via 25--PP, TaiG and PanGu Jailbreak Tools.